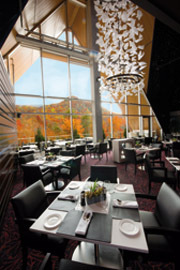 Altitude Seafood and Grill - Lounge Restaurant at Le Casino de Mont-Tremblant in Canada is new to the Mont-Tremblant restaurant scene having opened in September 2010. Although you can drive to the restaurant, we opted to take a romantic panoramic gondola ride to the restaurant, which features the talented Chef Christian Bolduc in the kitchen. The contemporary décor of the restaurant features a curved black wall that sparkles with fairy lights evoking memories of the clear Canadian night skies, an immense art chandelier resembling pieces of ice captures the eye, blue decorative strip lighting highlights dark wood walls, a small fireplace adds ambience, there is a long well-stocked bar, and a wall of windows inspires the guests to appreciate nature. 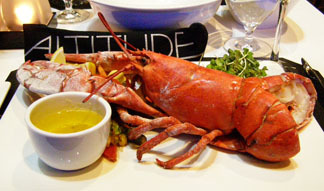 Edward and I had an excellent dinner on a Saturday night at Altitude Seafood and Grill - Lounge Restaurant at Le Casino de Mont-Tremblant in February 2011, and enjoyed listening to the live guitar music while we ate. Our server Louis-Philippe began our evening with an amuse bouche of artichoke and spinach spread accompanied with thinly sliced toasted baguettes, which was lovely to pair with our bottle of Roederer Brut, Anderson Valley, California, 12% alcohol, sparkling wine, made with 60% Chardonnay and 40% Pinot Noir with crisp, elegant notes of pear and light fruit, and persistent bubbles. For his appetizer, Edward had the Roasted Veal Sweetbread and Lobster with parsnip puree, celeriac salad, and hazelnuts. During an interview with Chef Christian Bolduc he stated that he is enjoying developing new and interesting approaches to preparing and presenting seafood to his clients, and his unique version of "surf and turf" had great visual presence, and harmonizing flavors and textures. His presentation consisted of the sweetbread on a bed of parsnip puree and au jus, topped with a generous lobster claw, crowned with julienne celeriac (celery root), garnished with micro-greens, and sprinkled with crushed hazelnuts. I had the Gourmet Crab Cake appetizer, presented as three large crispy crabmeat balls on a bed of julienne celeriac and corn remoulade, garnished with micro-greens, with a swirl of rich and spicy chipotle sauce on the plate. I really liked his approach to an old favorite, as by creating balls, instead of the usual flat cakes, there was more of the crispy surface, while the seasoned crabmeat inside was moist and succulent. Edward continued with a main course listed as the Seafood Plate, although a more accurate description would have been eating his way through the Seafood Market. 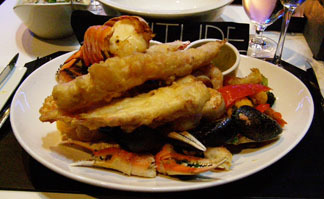 This course consisted of a generous portion of grilled salmon, tempura crab legs and claws, roasted lobster tail, stone crab claws, mussels, scallops, and shrimp steamed with garlic and ginger, served with a mélange of vegetables, seasoned white and brown rice with chopped scallions, and a spicy mayonnaise sauce. For my main course, I had the Atlantic Lobster, which was three-quarters of a pound of pure seafood pleasure, accompanied by garlic butter, micro-greens, a lemon, mélange of vegetables, and seasoned rice. Foregoing the garlic butter, the lobster was delicately sweet requiring no more than a small squeeze of lemon to enhance the flavor. We ended our meal with a visit to the dessert bar where an enticing assortment of pastries, fresh fruit, and a chocolate fountain beckoned. 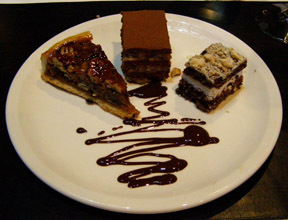 We selected a wedge of pecan pie and two sinfully rich layered chocolate desserts drizzled with melted chocolate from the chocolate fountain to share, which was the perfect ending to an excellent dinner. 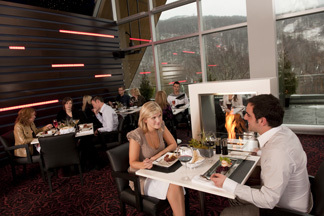 Altitude Seafood and Grill - Lounge Restaurant at Le Casino de Mont-Tremblant is for guests 18 years and older, proper dress required. The restaurant is open Monday through Friday from noon to 10:00 pm, on Saturday and Sunday from 11:00 am until 10:00 pm, and for Sunday Brunch from 11:00 am to 2:00 pm. The Lounge is open daily from 4:00 pm until closing. There is live music on Friday and Saturday evenings beginning at 9:30 pm, and live music during the Sunday Brunch. Le Casino de Mont-Tremblant is located on Versant Soleil, accessible by the Montée Ryan. There is a Gondola and a free shuttle to the Casino at Place des Voyageurs (next to Cabriolet). Upon request of clients, the shuttle may stop at different hotels within the village. 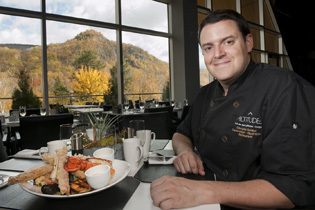 Read about Altitude Seafood and Grill - Lounge Restaurant at Le Casino de Mont-Tremblant in the Restaurants and in the Chefs' Recipes sections where Chef Christian Bolduc shares a delicious taste of the restaurant in English and French.